Like taxation, civil asset forfeiture is theft. In September, the House approved three separate amendments to Division C (appropriations for Commerce, Justice, and Science) of the Make America Secure and Prosperous Appropriations Act, H.R. 3354, that would have prohibited the use of funds to implement a directive issued by Attorney General Jeff Sessions to ramp up the use of civil asset forfeiture. 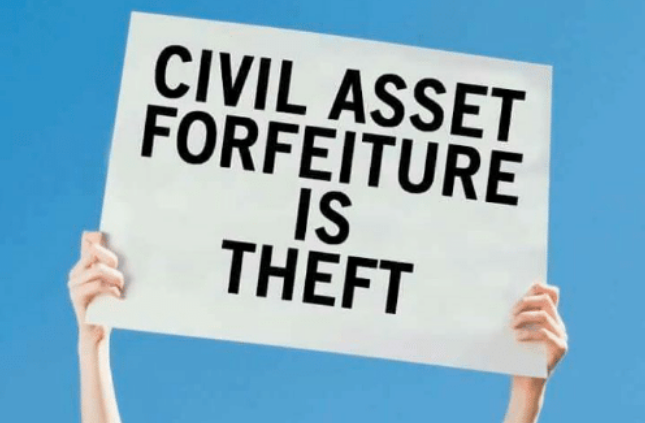 Civil asset forfeiture is the process by which law enforcement can seize property and money believed to be connected to a crime and subject it forfeiture based on a low evidentiary standard. The individual from whom the property has been seized doesn’t have to be arrested, charged with, or convicted of a crime to lose their property. In a perversion of justice, the burden of proof falls on the individual, not the government. The entire principle of the presumption of innocence is thrown out the window. The directive from Attorney General Sessions undermines some thoughtful, yet limited, administrative reforms during the previous administration, including the restrictions put in place on adoptive seizures. An adoptive seizure is when a federal agency adopts property or cash seized by a state or local law enforcement agency. Although Attorney General Sessions has ramped up the use of civil asset forfeiture, many states -- including Arizona, Florida, Iowa, Michigan, New Mexico, and Pennsylvania -- have passed legislation to reform their own forfeiture statutes, requiring a higher evidentiary standard. Some states require a criminal conviction. Others eliminated what is known as the “federal loophole” to prevent law enforcement from circumventing protective state law to use federal law through adoptive seizure. Reps. Tim Walberg (R-Wis.) and Jamie Raskin (D-Md.) offered separate amendments to the Make America Secure and Prosperous Appropriations Act, Amendment 46 and Amendment 67, to prevent the use of funds to implement Attorney General Sessions’ directive. The amendment offered by Rep. Justin Amash (R-Mich.), Amendment 70, would have left the minor positive parts of Attorney General Sessions’ directive in place while prohibiting funds from being used to the specific activity of adoptive seizures. Each of these amendments was passed by voice, which is to say that the amendments approved unanimously without the need for a roll call vote, and included in the text of Division C of the Make America Secure and Prosperous Appropriations Act. It was a positive sign for civil asset forfeiture reform and the rights to due process and legal principle of the presumption of innocence. Unfortunately, the Consolidated Appropriations Act doesn’t include the language of these amendments. The reason why these amendments weren’t included isn’t clear, but one would have to assume that the Department of Justice requested that congressional leadership and appropriators not include them. It’s now more important than ever that Congress pass civil asset forfeiture reform. FreedomWorks has released letters of support for the Fifth Amendment Integrity Restoration (FAIR) Act, S. 642 and H.R. 1555, and the DUE PROCESS Act, H.R. 1795. These bills would raise the evidentiary standard for forfeiture at the federal level to clear and convincing. The FAIR Act would eliminate the Department of Justice’s Equitable Sharing Program, which facilitates abuse and circumvention in states that don’t restrict adoptive seizures. Although the DUE PROCESS Act keeps the Equitable Sharing Program in place, it’s still as significant improvement over current law. Congress failed to address this issue in the Consolidated Appropriations Act, but it doesn’t mean that it can’t step up to address reform civil asset forfeiture laws in a meaningful way.